On the coast of Positano there were splendid villas during the Roman period, as evidenced by some remains at the church of the Assumption. 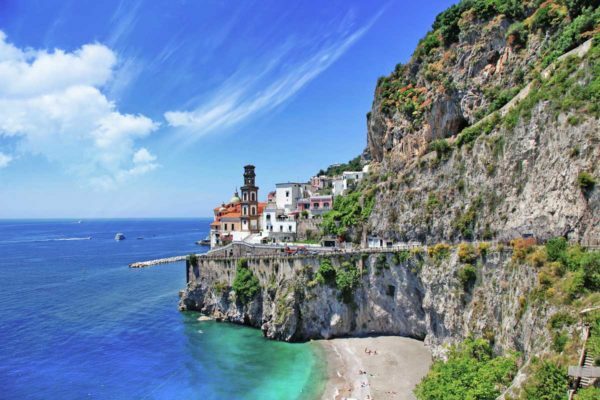 It is believed that the village was founded in the ninth century around a Benedictine abbey and then enlarged with the arrival of the inhabitants of Paestum, terrorized by the Saracen raids on the Amalfi Coast. 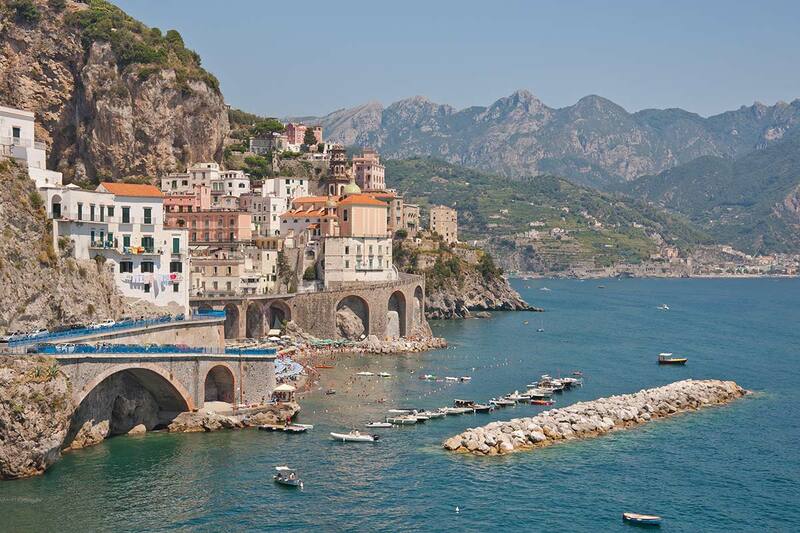 When in 1268 it was sacked by the Pisans it changed its urban layout to a defensive end, becoming similar to Amalfi with narrow streets, houses climbing on the rock, fortifications and watchtowers. From every point of the village you can admire the multicolored majolica dome of the Collegiata di Santa Maria Assunta which houses the black Madonna icon of Byzantine inspiration dating back to the 18th century. 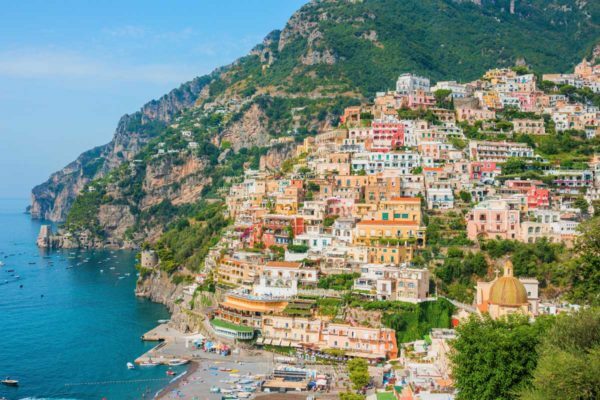 It was with the construction of the Statale 163 that this village of the Amalfi Coast began to rise again: first, in fact, the country was connected to the rest of the world and the coast only through impervious mountain paths. Among the various hypotheses, it is believed that Maiori was founded by the Greeks; others still claim that the Etruscans conquered the territories of the Amalfi coast, including Maiori. It is assumed that its original name was “Rheginna Maior”, to differentiate it from “Rheginna Minor”, currently Minori; following the name Sveva took the names of two rivers, Reginna and Reginnella. 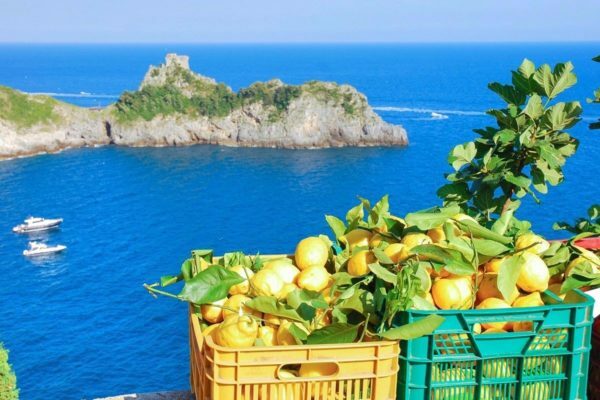 For centuries the territory of Amalfi has been a land of colonial vicissitudes: its strategic position created a natural link between Monte Chiunzi and the Vesuvian plain. 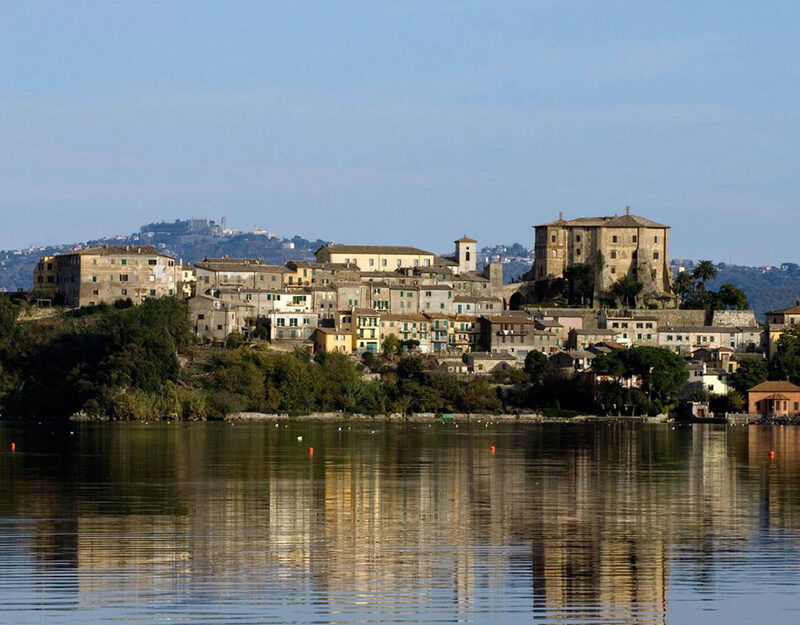 Among the wonders and riches of Maiori are also included the legends and myths that the inhabitants of the place jealously preserve: secular traditions handed down from generation to generation underline the beauty of a culture that must be preserved. They tell stories about the janare, women with magical powers that took the boats from the fishermen and then fly over the sea; some anecdotes see enchanting sirens as protagonists, others still concern the heroic vicissitudes of the sailors. 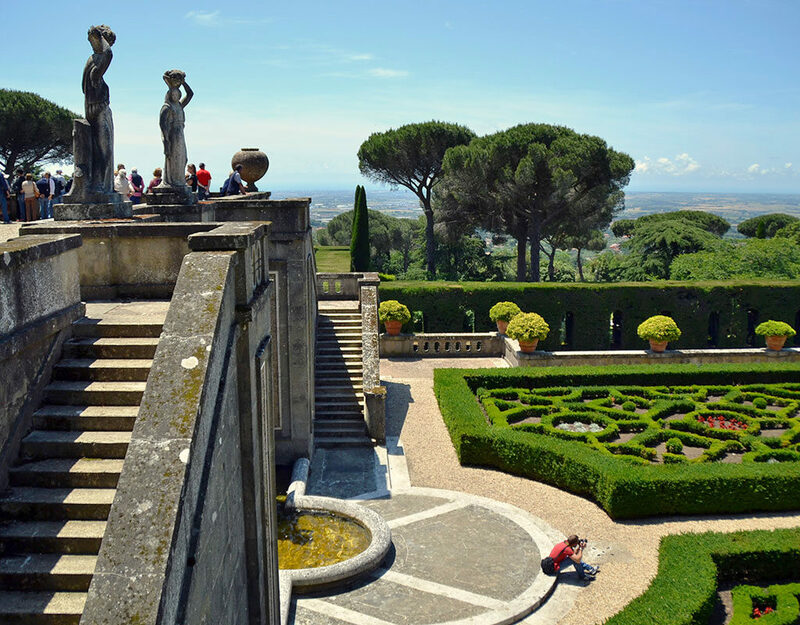 The tour can be chauffeured in several ways: from Napoli as day tour or shore excursion from the port and is anyway a shorter drive,from Rome as day trip,is a bit harder because the driving time is much longer but worthy and possible to do it. It requires minimum 12 hours at disposal and from Rome the price can be higher. Our minivan makes the tour anyway comfortable and gives the opportunity to stop whenever you need it. Saracen Towers: Built in the Middle Ages, they allowed the people of Positano and all the inhabitants of the Amalfi Coast to defend themselves against the incursions of the terrible Saracens. In the past, signals were sent from nearby towers to give the alert to defend themselves from invaders, but today they are perfect places from which to enjoy the enchanting scenery of the Amalfi Coast with its steep cliffs and villages overlooking the sea. Church of Santa Maria Assunta: 13th century church with the famous sun-kissed majolica dome. Inside it is possible to admire contemporary mosaics and colorful sculptures of great visual impact, by Mimmo Paladino. The alleys: They are wonderful, where you can get lost in the streets and you can go shopping, stroll, have dinner or have an aperitif and have a snack in the pastry shops. 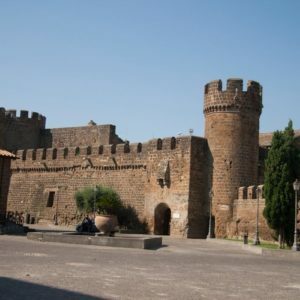 The small seaside resort is renowned for its monuments and museums open to tourists; precisely for this reason in 1997 it was declared by UNESCO as a World Heritage Site. 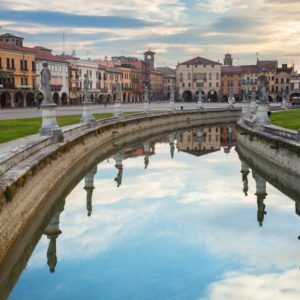 Cultural itineraries blend harmoniously with religious itineraries. 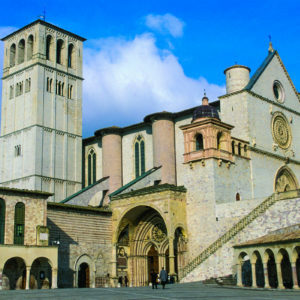 The collegiate church of Santa Maria a Mare, for example, is one of Maiori’s most important architectural attractions. Maiori represents a delicate balance between legends and metaphors, between tangible beauty and imaginable beauty. Its uniqueness is the mysterious charm that surrounds the town. Comparable to a small workshop of history and culture, it preserves the limpid memory of the past so much so as to make the visitor live the past that was, the present that is and the future that will be. Ad maiora, Maiori!